Welcome to the NBA Live 19 portal! This is a central hub for all the NBA Live 19 content here at the NLSC including news, reviews, feature articles, downloads and more. Patch 1.23 has come through for NBA Live 19. It contains a handful of fixes and optimisations, and also adds some new shoes to the game. The latest content update for NBA Live 19 includes updated rosters, ratings adjustments, and fixes for player gear and team colours. 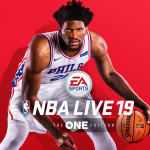 In Episode #278 of the NLSC Podcast: Updates for NBA Live 19, NBA 2K19, and NBA 2K Playgrounds 2, MyCAREER discoveries, and celebrity teams in video games. In Episode #277 of the NLSC Podcast: New content updates for NBA Live 19 and NBA 2K19, March Modness tips off, and more stories from the virtual hardwood.